Cellis Review: Valentus “healthy coffee” spinoff? Cellis operate in the nutritional supplement MLM niche and are based out of Texas in the US. The company is headed up by Cellis’ Founder and CEO, Korey Johnson. It’s worth noting that Johnson (right) resides in North Carolina, which is presumably where Cellis is actually operated from. As per Johnson’s Cellis corporate bio, he has ‘29 years in industry with high level field leadership experience‘ and has been a ‘6-figure earner in multiple companies‘. Two MLM companies I was able to tie Korey too were Waiora (circa 2010) and more recently, Valentus (2017). Johnson appears to have left Valentus in late 2017 or early 2018, however I wasn’t able to ascertain why. Read on for a full review of the Cellis MLM opportunity. Cellis market coffee, weight loss and insulin focused nutritional supplements. Joe+ is Cellis’ flagship product and is marketed as “coffee + benefits”. Cellis Joe + is the most delicious “Healthy Coffee” on the planet and is our proprietary blend of the finest coffee beans from Colombia, Garcinia Cambogia at 70% which active ingredient is HCA or Hydroxycitric Acid, L-Theanine an amino acid, and our proprietary ingredient Bio3C (Dihydroberberine). Stated benefits Cellis Joe+ may provide include healthy weight, glucose tolerance, appetite control and increased energy levels and mental alertness. 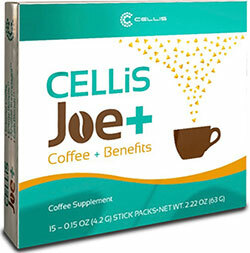 Cellis Joe+ is sold in a box of fifteen single-serve sticks, which retails for $67 for a one month supple twin-pack. Cellis market Fuse as a supplement that can be added to Joe+. Fuse is sold in a box of thirty capsules and retails at $37 a box. Optionally Joe+ and Fuse can be bought in a combo for $104 (one month supply). Bio3C is a standalone supplement that Cellis claims contains a “proprietary formulation”. boosts the effectiveness of insulin, which helps keep your blood sugar at optimal levels and promotes overall wellness. Bio3C is sold in a bottle of 60 capsules and retails at $87 a bottle. The Cellis compensation plan sees affiliates pay a fee to join. Commissions are paid when they recruit others who do the same. Cellis pay recruitment commissions via a unilevel compensation structure. Cellis cap recruitment commissions down three levels of recruitment. Commissions are paid when newly recruited affiliates pay for either a $536 Lifestyle Package or $1036 VIP Lifestyle Package. The Visionary Bonus is a recruitment based bonus paid per five Cellis affiliates recruited. How much of a Vizionary Bonus is paid out is determined by whether a Cellis affiliate signed up with a Lifestyle Package or VIP Lifestyle Package. By qualifying for a Visionary Bonus, Cellis affiliates also qualify for a Matching Bonus for 120 days. Specific details of the Matching Bonus are not provided in the Cellis compensation plan. Cellis affiliate membership costs $536 for a Lifestyle Pack or $1036 for a VIP Lifestyle Pack. 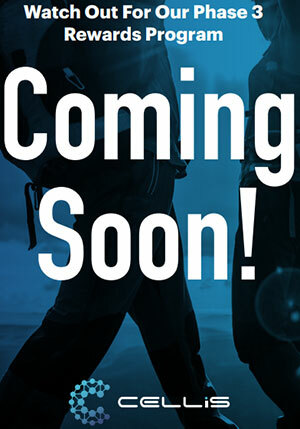 The primary difference between the packs are bundled products and income potential via the Cellis compensation plan. I can’t stress this enough; In its current state Cellis is without doubt operating as a pyramid scheme. There’s something about a “phase 3” at the end of the Cellis compensation plan, but with a foundation in pyramid recruitment – ultimately what Cellis does or doesn’t add to its income opportunity is irrelevant. Meanwhile the similarities between Cellis and Korey Johnson’s last company, Valentus, are hard to ignore. Both companies market a flagship coffee product and have a specific focus on autoship recruitment over retail sales. In fact there’s no mention of retail sales or any associated commissions whatsoever in Cellis’ compensation plan. In a marketing fluff-piece published on Ted Nuyten’s Business For Home in September 2017, Korey Johnson was cited as having a “thriving” Valentus business. Florida couple Korey and Renae Johnson love attending their children’s basketballgames, playing an active role in their church and traveling — and they do all of it while maintaining a thriving Valentus business. Surely moving from Florida to North Carolina wasn’t enough to see the Johnson’s throw in the towel? So… what happened? No idea, other than a distinct gap in Johnson’s Facebook timeline between November 2017 and February 2018, I wasn’t able to dig anything up. What I do know is that had I of joined Korey Johnson’s Valentus downline under the impression that as of September 2017 he had a “thriving” business, I’d be somewhat pissed. With respect to Cellis’ products, a July 20th Facebook post by Johnson reveals LacoreLabs are manufacturing them. LacoreLabs opened a new manufacturing facility in Texas in mid 2017. This probably explains Cellis’ provided Texas corporate address. We do not have a marketing department, we are a contract manufacturer. We develop the product and wait for someone to come to us. bring your own formula or work with our experts to design the right formula to suit your audience and budget. To what extent Cellis products were bought “off the shelf” or designed specifically for the company is unclear. To be clear, there’s nothing wrong with any of this. 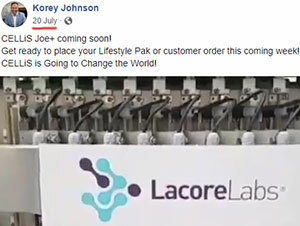 Despite Terry LaCore’s past, I’m not trying to present LaCoreLabs as anything more than a third-party manufacturer here. What I’m brought back to though is why Korey Johnson would abandon a “thriving” Valentus business and open up his own MLM company, complete with a pretty similar flagship product. Are things at Valentus not what they seem? Who knows. But what I do know is that Cellis is currently a fraudulent pyramid scheme. In addition to speaking volumes as to Valentus’ business model, Cellis’ compensation plan is pretty much where your own due-diligence should begin and end. This is straight-up chain recruitment and should have no place in the MLM industry. And coming from a self-proclaimed 29 year industry veteran? No excuses Korey, you should definitely know better.